Also posted on Global Voices. Various agencies and officials in the Georgian government are increasingly embracing social media and Web 2.0 tools in order to communicate with the country’s computerized population. As the technology develops and more Georgians join social media sites, it becomes clear that the government intends to directly connect with its citizens. The leading reformer in the region, Georgia follows a world-wide trend of digitization and e-government by taking concrete steps online. 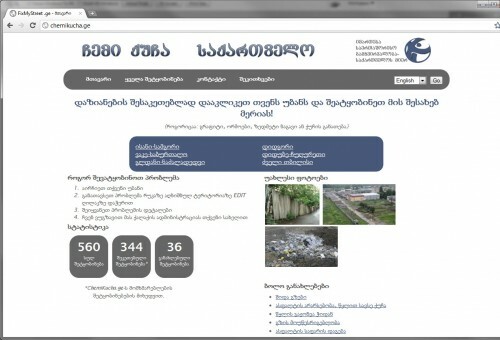 For example, citizens can download the driver’s license preparation test from the website of the Ministry of Internal Affairs, register and declare their property on the Revenue Service’s website and, in February this year, Transparency International Georgia, with the support of the Eurasia Partnership Foundation in Georgia, launched Chemikucha.ge, a local version of the British FixMyStreet.com, an online platform enabling citizens to report problems such as potholes or garbage collection.